Northern Uganda | The Lord’s Resistance Army’s reign of terror throughout rural Uganda triggered a wave of mass chaos. Thousands of Ugandans fled to escape the violence of the rebel army, causing a refugee crisis of disastrous proportions. Because either their homes had been ransacked or occupied by the soldiers, many remained homeless, terrified to return. As the numbers of internally displaced Ugandans began to rise, relief agencies set up makeshift camps to accommodate the masses. These camps were only meant to be temporary shelters . . . but for several years, thousands of Ugandans remained there . . . virtually trapped in their own country. They had no place to go, no jobs to earn a living, and a future that was desperate and uncertain. The conditions in the camps were terrible. Sanitation was nonexistent and the threat of violence was around every corner. Crime and trafficking were a means of survival—certainly no place for children . . . especially those who had already endured unimaginable trauma. World Help partners Cindy Cunningham and Rose Abner saw the desperate living conditions in these camps, and they immediately established a Village of Hope to serve as a place of refuge for orphaned children. Teaming up with World Help, the Osenbaugh family and Christine Tholen generously provided the funding for two Homes of Hope . . . and now, 48 boys and girls have a place they can call home for the very first time! When we arrived at this facility, our team was welcomed by each of these incredible children who are benefitting from this program. Because of dedicated partners and supporters, these children now have shelter, food, clothing, medical treatment, an education, and the opportunity to grow spiritually. What a gift! World Help’s Regional Director of Africa, Cyrus Mad-Bondo, is behind each of these projects, working tirelessly to ensure each child is cared for and every donor knows the full impact of their generosity. As a native of the Central African Republic, Cyrus brings invaluable perspective to our work in Africa . . . but his passion for people is what impresses me the most. I know he’s someone I can always count on—as a co-worker, a leader, and a friend. He is a crucial part of our team—we couldn’t do what we do here without him. 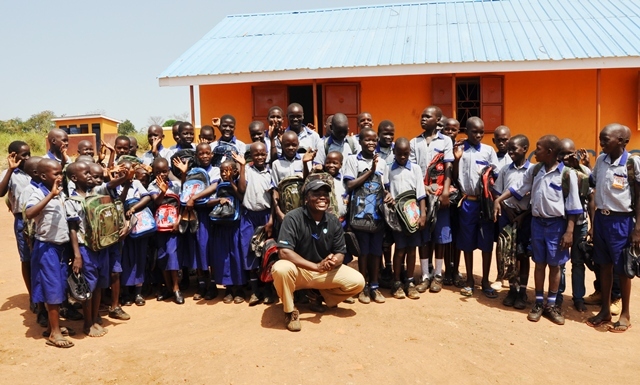 Cyrus Mad-Bondo with the children from the Village of Hope in Uganda. Upon my arrival at the Village of Hope today, it was evident that these children are very happy. I was greeted by their beautiful songs. The highlight was seeing each one receive shoes and a backpack filled with school supplies. Many thanks to our supporters who have provided these needed resources through Gifts of Hope . . . the children were so excited! 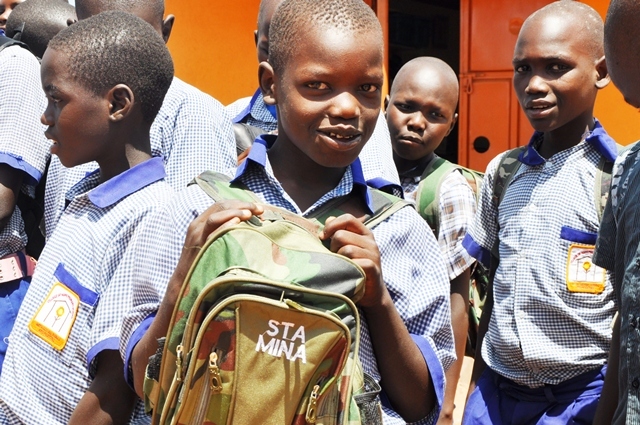 A boy from our Home of Hope with his new bag full of school supplies. Today, I was reminded that God can use just a handful of people to make a significant impact. Our donors give their resources, their prayers, and their time. Our staff works around the clock to ensure our work is done with integrity and excellence. And our network of international partners enable us to be effective and strategic with each and every project. It’s these combined efforts that have allowed us to reach millions of people over the last 20 years. And now, children who had lost all hope are laughing again. They have food to eat and clothes to wear. They have the opportunity to grow and learn in a safe environment. They are surrounded by teachers and caretakers who care about their futures and who pray for them daily . . .
. . . All because a few ordinary people decided to care and get involved in making a difference. It’s not just an investment for today, it’s an impact that will outlive us and last for eternity. 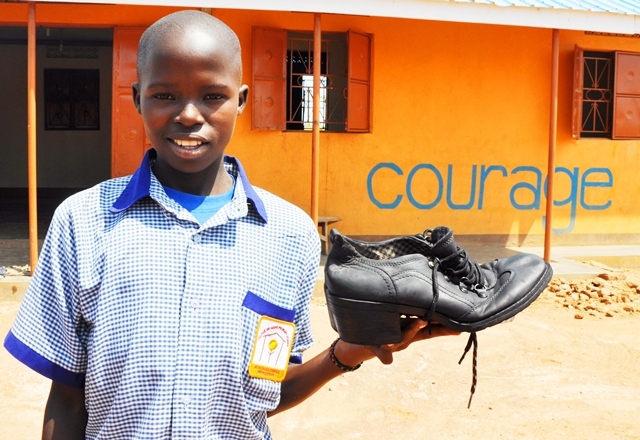 We distributed new shoes, given through Gifts of Hope. 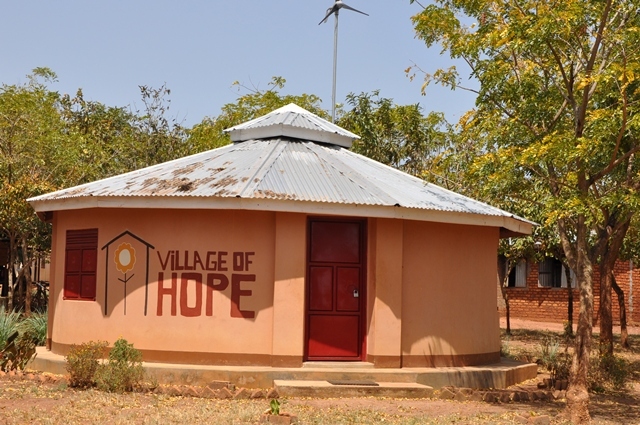 This Village of Hope is a safe haven for children terrorized by the Lord’s Resistance Army.